A former German international at youth level, Lindner gave up the opportunity to represent her country at senior level by moving to the USA on a college scholarship. Lindner joined Glasgow City in 2005 after moving to Scotland to complete a PhD in film studies. 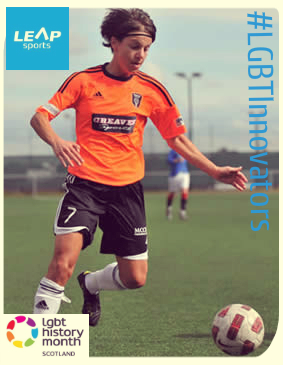 She quickly established herself as a pivotal member of Glasgow City’s strike force and was voted the club’s player of the year on two occasions. She represented Glasgow City in European competition more often than any other player and held the record for the most European appearances for a Scottish club. Kat is now a Lecturer in Film and Media at Stirling University and a member of the Centre for Gender & Feminist Studies. Kat is a Board Member of LEAP Sports – we are delighted to spotlight one of our talented and dedicated volunteers as part of LGBT History Month!